Back at the GDC 2019 in mid-March, Nvidia CEO Jensen Huang revealed that real-time raytracing technology was about to become available to a lot more Nvidia GPU owners in the coming weeks. Today the driver enabling real-time raytracing on the GTX 1060 6GB and better has been released. It is called the GeForce Game Ready Driver version 425.31 WHQL and is available immediately. Thanks to this new driver there are now "tens of millions of DXR GPUs" in consumer PCs. With the new driver installed "millions more gamers with GeForce GTX GPUs to experience ray tracing for the first time ever," says Nvidia. However, one must remember that with their dedicated RT cores, the GeForce RTX 20 range provide up to 2-3x faster performance in raytraced games, facilitating more effects, higher ray counts, and higher resolutions. In other words, Nvidia VP of Technical Marketing, Tony Tamasi, says "even folks that have Pascal, if they just want to check it out, they can at least see what raytracing looks like and get a little taste for themselves". See the explainer video featuring Tamasi embedded below. Above you will see Mr Tamasi explain that some raytraced games effects will work acceptably on the more powerful Pascal cards - but in the newest and more demanding titles such as Metro Exodus GTX 10 and GTX 16 graphics card owners should probably only turn on raytracing for a quick look at the eye candy they are missing. A processing example of a single Metro Exodus frame is provided in the image above. Nvidia's Tech Marketing VP has highlighted the GTX 1080 Ti SM processing of raytracing imagery with a green box. You can see it takes up a lot of frame rending time - about 80 per cent of the time used. Moving down to the next row you can see that an RTX 2080 which can execute floating point and integer instructions (purple) simultaneously. The best case is seen in the bottom row where the RTX 2080 RT cores are put to task, massively accelerating this rendering task. 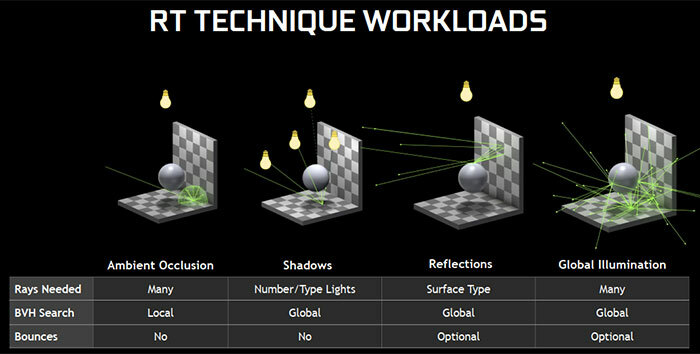 It is also clearly explained that various types of raytracing loads come with varying performance penalties. Above, left to right you can see that RT Ambient Occlusion isn't going to cause much strain on a GPU, while Global Illumination relies on considerably more intense calculations. Nvidia has shared some ray tracing gaming benchmark comparisons in games such as Shadow of the Tomb Raider, Metro Exodus, and in various tech demos on its blog. In these games you will not be aiming to run 'Ultra DXR' settings if you are sporting a GTX 10 or GTX 16 card so that will of course help you to enjoy some DXR at acceptable performance levels dependent upon your PC config. On the topic of demos you can now download (scroll down half way for links) and run the following demos on your RTX enabled graphics card: Justice Online, Atomic Heart, and Reflections. Lastly, remember that stunning real-time raytracing is possible at high resolutions and acceptable framerates on AMD cards too, such as the Radeon Vega 56, with the right graphics engine and support. The best case is seen in the bottom row where the RTX 2080 RT cores are put to task, massively accelerating this rendering task. You appear to have missed the fact DLSS is turned on for the 2080 bottom row, so it's not a like for like (or resolution for resolution) comparison. Honestly, if I'd bought an RTX card based on the ray tracing stuff right now, I'd be pissed. I know they provide better performance but they were making out this was exclusive, hardware dependent stuff. Now it turns out it really, really isn't. 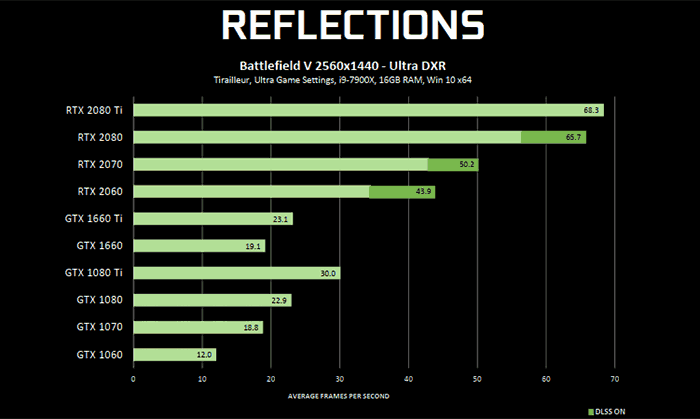 If I had a card that was providing acceptable performance and bought an RTX card for the ray tracing capability, I'd be pretty annoyed right now as I'd almost certainly have held off until it became more popular and to see what the competition provided. This has also come out very quickly after software based ray tracing was demonstrated on AMD cards so must have been in the works for a while, don't you think? I have an RTX 2070 and don't really use rt. It's gonna kill these cards so what's the point? The point of this is great marketing, Mr 1080Ti is going to go from having an elite early adopter card to not even being able to keep up with a 2060 in RTX titles, it is going to make said Mr. enthusiast get a glimpse, a taste if you like and then be hooked and want more. They are also probably hoping this will give devs a nudge to get higher adoption rates across the board. Say what you will but this is a power move and it's a gooden from a business perspective. If you can't see your old card chugging, how do you know you need a new one? On a less sceptical note this seems a double edged sword. On the one hand getting RTX into more hands could help adoption, on the other hand if 80% of the cards out there aren't up to the task then we might get very watered down ray tracing that never needs the newer cards.